There is wisdom in the definition of Six Sigma, which is 3.4 defects per one million opportunities (DPMO), allowing for a 1.5 Sigma shift. But, some companies subscribe to sloganeering such as “Zero Defects”. Indeed, there should be processes where we get as close as possible to zero defects. The “Zero Defects” sloganeering is counterproductive, unhelpful, statistically impossible, and completely cost prohibitive. But is Zero Defects impossible? Maybe not, if we make good use of Poka Yoke, maybe we can get close to zero defects with minimal costs. 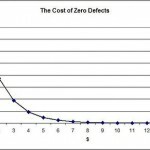 Statistically, zero defects means a defect level of infinity sigma, which is not possible. What most people mean, is an attitude toward process improvement, but the sloganeering gets in the way. I had the pleasure of working at a company that tried to enforce a ‘zero tolerance’ stance on software and editorial defects. I certainly will never institute such a policy at my current employer for our developers. 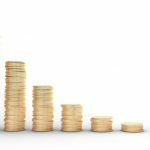 To work towards approaching zero (regardless of whether that number is 10, 100, 1000 or whatever is right for the resources you have at hand and the value it delivers to the business) is a much better approach in practice. Fundamentally, it needs to be appreciated that there is a difference between reducing defects and eliminating them. 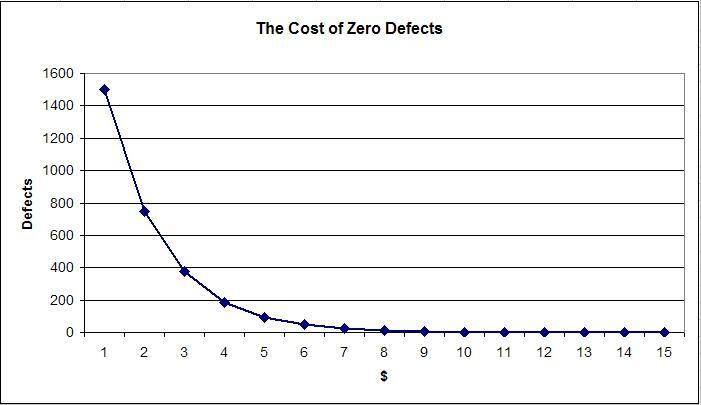 The cost of trying to support zero defects goes up exponentially as you get closer to zero. Deming used the red bead experiment to highlight that if a process has a failure rate built into it from the beginning, worker competence is not the issue. It really is all about management. I think there’s a difference between “zero tolerance” and a goal of “zero defects.” Zero tolerance is a dumb policy if you’re going to be overly punitive and point fingers (or fire people) every time a mistake is made. We’re human. The Toyota Production System recognizes this. Poka-Yoke is absoutely the way to go for newly-created processes, or as an solution for already-created processes but are producing defects. For mature firms, however, there exists processes, methods, tribal knowledge, and culture, that need help. Yes, prevent errors through mistake-proofing; for processes that have already been engineered but are producing defective products — that was really the point of this article. Poka-Yoke can also be applied to existing processes, and not just in manufacturing. 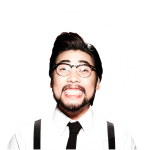 You can apply poka-yoke to business processes, as well. Peter’s graph is precisely why the founders of the Toyota Production System emphasized built-in quality (jidoka). Arguably more important than error-proofing (pokayoke), built-in quality is the antidote to the futility of “quality by inspection”. 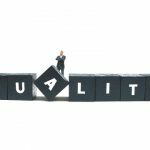 In the Lean community, I personally don’t feel the proper emphasis being given to built-in quality, and I’m not sure why. The Taguchi Loss Function demonstrates that quality cannot be inspected in, but it can be controlled through robust design. Likewise, proper equipment design can catch quality defects and stop the process before they are passed on to the customer (or the next process). Mark is absolutely right that you can error-proof any business process, but I’m more interested in why companies don’t emphasize DFx in process design like they do for product design. Building quality into business processes is about the fundamentals — robust design and visual management (what makes any generic business process stop when quality is unacceptable). Your post completely ignores the fact that if you could achieve Zero Defects the process would be not only faster, but immensely cheaper! This is not true. this has been achieved by ignoring the customer complaint and forcing Toyota’s bad products on to the customers. Toyota Etios common Problems faced by owner of Toyota Etios model-V.
1) Engine Vibration at Idle/ Neutral position. When the vehicle ignition is switched “ON” the vehicle shakes heavily and produces noise. Secondly when the vehicle is “START” and the gear is Neutral/ idling condition – vehicle produces lot of vibration.This vibration is irritating and distracts attention for every moment spent in the Etios.The vibrations are so intense that the vibrations are felt in the driver and passenger seats, steering, side arm rest, roof top, tail ( boot space) of my etios. 2) Road Noise inside the cabin. When the vehicle is moving on the road, great amount of sound from the tyre reaches the inside cabin of the car, which is very irritating while driving.This noise is heard even with window glass closed and AC switched ON. 3) Engine Noise inside the cabin. The vehicle produces a lot of noise while accelerating. It sounds as if lot of lot of load has been put on the engine even with light load in the car (with 2 passengers inside the cabin). This noise is very distracting while driving. 4 ) Absence of Weather gaskets on all four Doors. The absence of gasket makes it convenient for insects, cockroaches, ants, spiders and lizards to get inside the vehicle as soon as the door is opened. The interior area of the cabin trapped between the frame and door is always dirty even though the vehicle is cleaned from outside. Less weight of the car makes it bouncy on road.The suspension is poor and the impact of the holes on road comes directly to the passsngers inside the car cabin. The ride is rough. The comfort part is missing from the vehicle. The battery drains out completely in less than a weeks time of non usage of the vehicle. It has happened with me three times. The pain quality is poor as it chips out and cracks out. The Air Conditioner, when it is switched off produces bad smell inside the cabin. The brakes are ineffective and takes time to fully act on pedal press. On application of reverse gear the gears make jarring noise. This is very annoying. The transmission is very poorly designed which takes lot of effort to shift gears. One feels like fighting with every gear change. This is because of poor acoustic insulation in Etios that the sound of horn is heard more inside the passenger cabin than outside. The pickup is very low at any gear and even the new vehicle seems to be tired and exhausted. The actual mileage of ETIOS in city conditions is not more than 10 kilometer per litre in city conditions. The company claims it to be more than 17.5 kilometers per litre. The interior plastic quality is very raw and gives a very cheap feeling. The interior plastic shade is also very irritating. The seats are also of very poor quality. The interior plastic has started making absurd noise because of excessive vibrations in the vehicle. The stepney- spare wheel supplied along with toyota etios model v is non alloy wheel where as all the other tyres are alloy wheels. 16) Remote unit for remote locking There is only one remote control unit supplied along with the vehicle. 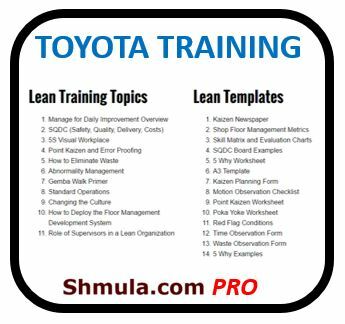 I am surpised to see a Lean/SS guy challenge the Zero Defect sloganeering. As an unabashed proponent of Dr. Deming, “Zero Defect” violates at the very least: Point 10, Eliminate Slogans; Point 11, Eliminate Numerical Quotas (managing people directly by numbers) and Point12, Remove Barriers to Pride of Workmanship. I agree with your premise, Pete. If “zero defects” is just an empty slogan, that’s bad and counterproductive and a recipe for frustration. But if we have a METHOD to prevent errors – for example, getting hospital acquired infections or patient falls to zero through better processes and better management (not through slogans), then that is an admirable (and increasingly achievable) goal. It will always be continuous quality improvement. There is certainly huge room for improvement for hospital falls and infections, things that have been close to my heart. This criticism of Zero Defects was described by Dr. Deming, for the same reasons; it lacking statistical thinking and and relying on slogans. Later after discussion with Dr. Crosby he changed his understanding, and also published why. Crosby’s Zero Defects was about REAL specs. and drawings with the correct, absolute requirements on them. Zero Defects, to Crosby, is therefore about meeting the requirements. And everyone should know what they are, so that besides knowing how well they are doing, next they can also make the cultural adjustment that defects are NOT acceptable. There is no acceptable number. There is no number that when you “get there” you are done. This thinking process leads you right towards and into what Deming called profound knowledge, including statistically founded tools. Deming said that once he understood that what Crosby had done was place a very specific set of definitions around what he meant by Zero Defects (specification for the term!) he agreed that it was completely compatible with statistical thinking. Though of course he maintained his skepticism about signs and slogans. Some people just seem to like that rah-rah stuff though. So, have there been occasions for the Zero Defects name to be applied to something totally incongruous to what Crosby and also Deming would have taught! Sure!!! Doesn’t mean they are doing it right, and it is wrong to judge what one man called Zero Defects based upon what somebody else did, using the same name. Crosby used an analogy of the game of golf. There are rules to the game, they are specific. But on any course, you may find someone who hits a provisional ball, and so pretends to lose the worst. He may hit to a hazard, and take a drop, but not record a penalty stroke. He may five put the green, but record four and say “Mulligan”. This player is in golf clothes and shoes. He is hauling golf clubs. He is riding a golf cart. He is swinging golf clubs at golf balls and doing all of the activities of golf— but he is NOT playing golf. He is playing some game of his own personal invention, but it is not golf. Though he will probably tell anyone who listens how great the game is and how he loves golf. So if you read the rulebook, and observed this player who said he was golfing, you would conclude that Golf is a dishonest endeavor for seemingly made for cheats and liars. You might condemn the game of golf, based upon observing this “golfer” up close. The mistake—- while going though some of the motions, he was not actually playing golf, and it is completely wrong to judge golf on someone who isn’t even actually playing the game, but just using the same WORDS and MOTIONS. So it can be with programs and processes. As to the Six Sigma number of 3.4 defects per million, to me that’s awful close to unrealistic for the vast majority of processes as well. I have been through the training programs and I think the tools applied are of more than great utility. But plus-minus six sigma?! Is that realistic or even always necessary? I have great doubts. I find the concept of Taguchi loss function to be far more applicable in most settings. My unsubstantiated opinion is that the original explanation to some manager at Motorola was that the engineer was promoting plus-minus 3 sigma, for a total of Six Sigma. Then it was imparted up the chain and somehow (like the game of telephone) it was confused to plus minus Six Sigma. And then, after the fact, to protect the management from embarrassment; all of the documentation became about justifying “plus-minus six sigma” 3.4 dmo. And so here we are talking about statistical thinking and realistic expectations, while at the same time promoting a with a name that is for the vast majority, unachievable. Kind of like back in the fifties, the Lockheed Skunk-Works designed the Blackbird. One version became the RS-71 (Reconasance-Supersonic type 71). Then they decided to let the President, Eisenhower announce the plane’s existence at a press conference where he slipped and said it was the SR-71. NOBODY corrected the President or even mentioned it. From then on, everything was officially the SR-71. Kind of like (I believe) Six-Sigma total became to a high level manager Plus Minus Six Sigma. And here we are talking about 3.4 DMO like it is real or even realistic.